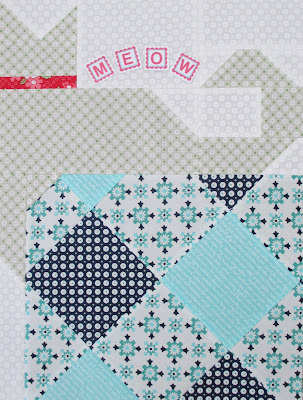 This month's block is Quilty Cat, my latest favorite. At the beginning of this sew along I would have thought I would be saying my least favorite, but now that this block is done, I really do like it, even if my house is a dog house. Funny story, when I first looked at the pattern I thought this block was called Grumpy Cat, which I thought was hilarious. But it's Quilty Cat, a more appropriate but less entertaining name. This block is very easy and goes together quickly. It only has 35 pieces. I finished this block in less than two hours, start to finish! I made my block exactly like the pattern except for swapping the navy sailboat print for the navy circle print. I still need to add some eyes, I'm going to attach some fabric eyes now, instead of adding button eyes later. 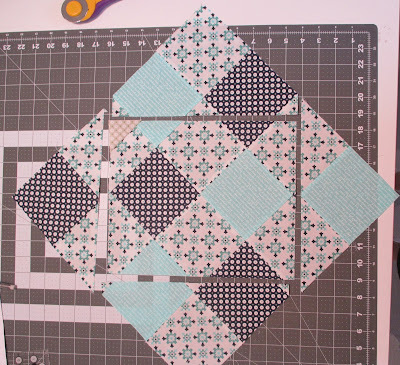 Here's a picture of how I trimmed the scrappy blue quilt unit block. I found it easier to trim with the block set on point and ruler straight as opposed to running the ruler diagonally as shown in the pattern. 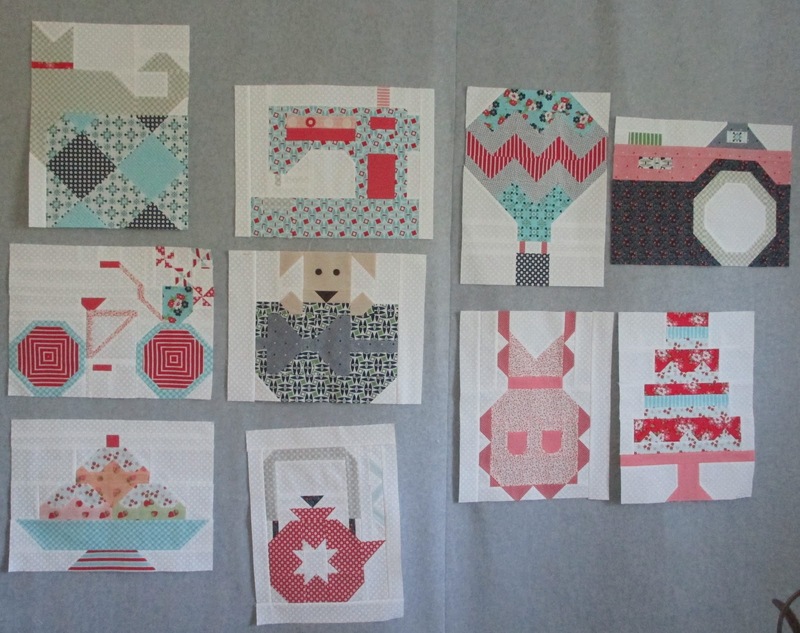 Here are all my pieced blocks. So about this time during a sew along it's so easy to fall behind, lose interest, or even drop out. 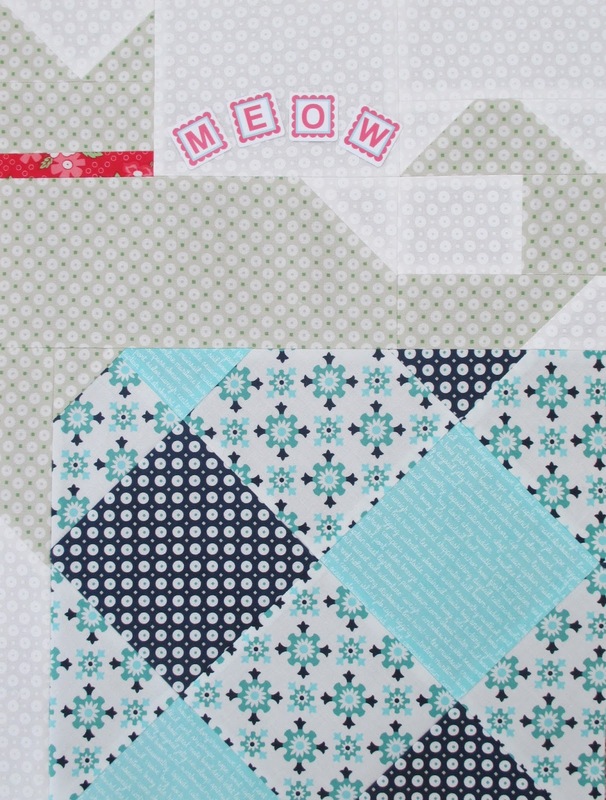 If you're behind a block or two at least piece Quilty Cat this month! Maybe that will motivate you to finish some of the other blocks, and if not, you'll at least have one more block pieced. Just because you've missed a couple of blocks don't think you have to wait to piece this fun and easy kitty. 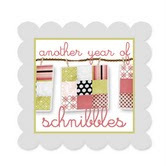 I've enjoyed sewing each block each month, but I have a deadline to blog about the latest block, congratulations to those of you who have also pieced your blocks right along with me! We only have 3 more blocks to go! I am thrilled that the FQS has already surpassed it's initial goal of raising $10,000 for St. Jude Children's Research Hospital and its new goal of $20,000. The last time I checked the amount raised was over $31,189, how great is that! As a reminder, the monthly patterns are a free download, a donation is up to you, the suggested donation is $5. Here is a link to the pattern, instructional video, donation page, and everything else you need to know. 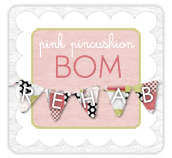 (click here) The backing and finishing directions are also now available. Hmmm...another month has come and gone and I have not started yet. Love your block, but like you I am not a cat person...I may have to do something different, but first I need to start. Great job once again Thelma, very inspiring! thanks for that. I am behind three blocks and the cat makes four. I think I will get back on track with the cat. My ice cream block is pieced part way. I lost my mojo for this sew along but I don't want to pack it away completely. I needed that little push. I would love to embroider MEOW on my cat block. Could you tell me where you got the embroidery alphabet please? It's adorable! Those tiles came from the Fat Quarter Shop. Voila, it's a finish . . . .